Jose Luis Romo Martin was born in Mexico City and raised in Valle del Mezquital in the state of Hidalgo. It was here that he learned the customs and language of the Otomí tribe. He also found himself memorizing the lines of the horizon, the vibration of the land and the light to use later on in his paintings. He studied lithography at the Escuela Nacional de Pintura y Escultura La Esmeralda in 1974 and later serigraphy with Jan Hendrix. He was also a pupil and assistant to Gunther Gerzso from 1989 and until 1981. His learning process, however, was not limited to his influences, for he transcended them to achieve his own dramatic style. Romo worked as an engraver for the Taller de Santo Domingo, while he participated actively inn several collective exhibits. 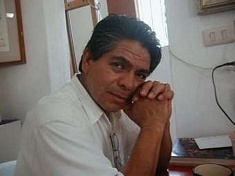 His work has been exhibited individually numerous times by the Galería de Arte Mexicano in Mexico City. In 1982 he became founding a member of the Casa de la Cultura de Ixmiquilpan Estado de Hidalgo. In 1984 he was awarded honors at the Biennale of Self Portraits organized by Casa Domecq. He lived in Ixmiquilpan Hidalgo surrounded by the landscapes of his childhood before setting up his workshop in Queretaro. This brilliant Mexican artist passed away after battling stomach cancer in late May 2016.